About This Bright Light of Ours: Maria Gitin was an idealistic 19 year old college freshman from a small farming community north of San Francisco who felt called to action when she saw televised images of brutal attacks on peaceful demonstrators during Bloody Sunday, in Selma, Alabama. Atypical among white civil rights volunteers, Gitin came from a rural low income family. She raised funds to attend an intensive orientation in Atlanta featuring now-legendary civil rights leaders including Hosea Williams, Andrew Young, Dorothy Cotton, Septima Clark and Martin Luther King Jr. Her detailed letters include the first narrative account of this orientation and the only in-depth field report from a teenage participant in the Summer Community Organization and Political Education (SCOPE) project of SCLC. Gitin details the dangerous life of civil rights activists in rural Wilcox County, Alabama, where she was assigned. She tells of threats and arrests, but also of forming deep friendships and of falling in love – a coming of age story in the midst of a battle for the rights of all in a violently segregated section of the South. We learn more about the similarities and differences between SCLC, the organization headed by Martin Luther King and other ministers, and SNCC, the activist youth organization both which claimed Maria’s membership and loyalty. More than four decades later, Gitin returned to Wilcox County to revisit the people and places that she could never forget and to discover their views of the “outside agitators.” Through conversational interviews with more than fifty Wilcox County residents and former civil rights workers, she has created a channel for the voices of these unheralded heroes who formed the backbone of the civil rights movement. Stunning stories of the segregated youth fighting back against the ‘powers that be’ are balanced with pride in progress as well as informed criticism of what still needs to change to bring about full economic and racial equality. 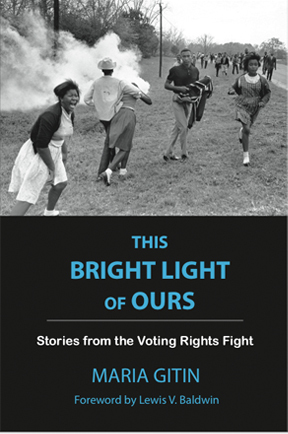 Read what civil rights scholars and veterans are saying about This Bright Light of Ours.